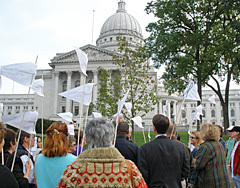 Construction on the capitol square didn&apos;t prevent advocates from remembering their loved ones lost to domestic violence. Every nine seconds, a woman in the United States is beaten, however Dane County District Attorney Brian Blanchard says people who have not been directly exposed to domestic violence don&apos;t quite understand it. "We need to stop blaming alcohol; we need to stop blaming stress as the cause of domestic voilence. People choose — or not — to be violent to each other. And it doesn&apos;t matter under the law whether it happens on the street or whether it happens in the house whether it happens in school or whether it happens in the hospital. The law treats it as the same." Blanchard says it&apos;s easy for the abuser to terrorize his victim, because they know each other so well. "Abusers take advantage of their knowledge of the victim. The feelings of intimacy — genuine love that has existed or maybe still exists between the people — they take advantage of that to terrorize other people." Also, we need to stop blaming the victim. Blanchard says abusers can traumatize their victim by threatening to hurt their kids, property, or pets. According to domestic abuse groups, one out of four women will experience domestic abuse in her lifetime. Wisconsin averaged 3.3 domestic violence homicides every month in 2007. NOTE: City and county leaders converged at the state capitol for the 2008 Purple Ribbon Walk to publicly remember those killed in domestic violence homicides. The Purple Ribbon Walk, organized by the Zonta Club of Madison, recognizes Domestic Violence Awareness Month and coincides with the National Day of Unity to End Domestic Violence.